This large yacht from the Variety Cruises guarantees you a memorable holiday –boasting elegant design and a powerful engine giving you the most comfortable cruising experience yet. The cabins in this yacht aim to satisfy every kind of passenger possible giving the highest level of comfort combined with warm colours to give you a unique holiday. The unique nautical atmosphere stems from the large windows within the cabins. The cabins feature two to four beds, a bathroom with shower, toilet, hairdryer, adjustable air conditioning, satellite TV, a telephone, mini safe, mini bar and music for relaxation. The stylish restaurant on board the MY Harmony V gives you classy dining coupled with stunning panoramic views of the passing scenery. The kitchen serve only the most delicious meals and specialties using local spices to give your meal a flavour explosion. If you prefer to eat al fresco then you can go to the open-air restaurant on the sun deck. It is possible to have a vegetarian option or specialist diet if you make a request in advance. The Lounge Bar (located in the restaurant) along with the outdoor bar on the sun deck are the best places to have a drink after dinner. Here you can enjoy a wonderful, romantic time with your partner or get to know fellow passengers. During the daytime, the sun deck is the ideal place to relax and sunbathe or read a good book while enjoying the beautiful scenery until you reach the shore. The large indoor lounge is a fine place to spend your evenings for relaxation and enjoyment. The destinations which the MY Harmony V visits span across areas where one can go kayaking and snorkelling, and allow you to experience the underwater worlds (as well as those on shore!) There is the chance to sail and optional excursions to get to know the locations even better. 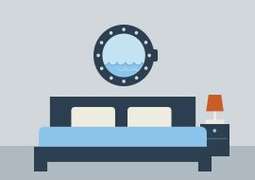 The ship also has a platform which gives you direct access to the sea. The spa aboard the MY Harmony V gives you every opportunity to be treated like a queen or king, with a health program that includes a variety of massages, facials, pedicures and hair treatments.